This is a guest post from Shannon Mahoney, an aquarist working in our off-site Animal Care Center in Quincy, Mass. She helps care for animals before they go on exhibit. In this post, she explains how the Quincy team also rears larval fish from eggs laid in the exhibits on Central Wharf. 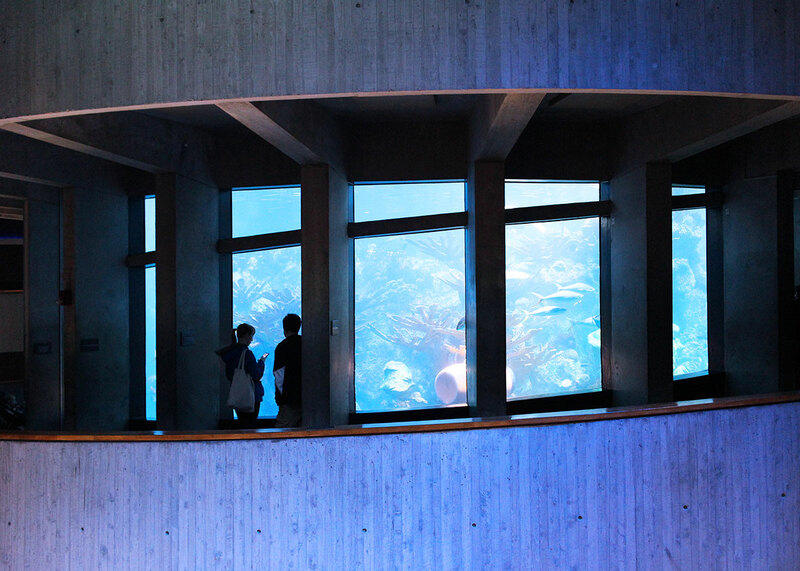 Every so often we add new fishes to the Giant Ocean Tank and each of them usually has a unique story about how they arrived at the New England Aquarium. Some are from our Bahamas expeditions, some are Gulf Stream orphans, and some of the newest additions are actually returning to the GOT, now as juvenile fish that we reared from eggs harvested from the tank nearly a year ago. But let's take a step back and talk about fish and their eggs. Almost all marine fishes release eggs that develop and hatch while exposed to the elements of the ocean. You can find some exceptions to that rule at the Aquarium, like live-bearing lined seahorses, but the majority of the fishes at the Aquarium are either pelagic spawners that release eggs into the water column, or demersal spawners that lay eggs on some kind of object or substrate in the tank. On June 7, 2015, GOT divers came across a demersal egg “nest” at the bottom of the tank that was being defended by blue chromis. We are in the early stages of developing a larval rearing program at NEAq and blue chromis are high on the list of desired species to raise in house, so we were all very excited to hear the news of a fresh nest. The nest was transported to our offsite facility where we have dedicated space for special larval rearing tanks and to culture live foods for larval fish. 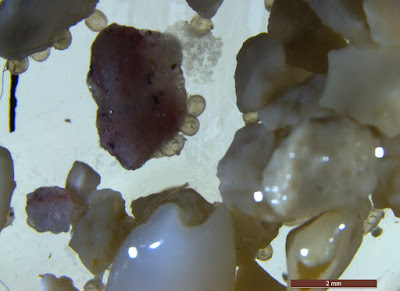 The eggs are super tiny and super sticky so they attach to individual sand grains as you can see below. See the tiny, round eggs sticking to the grains of sand? It takes a lot of trial and error to figure out the best method to raise larval fish because every species can have different temperature, light and food preferences. Because of this we take careful notes of everything, and we try to take a lot of pictures to track the growth of the larvae. About 10 days after hatching we noticed dorsal spines developing on the larvae that were definitely not chromis-like. 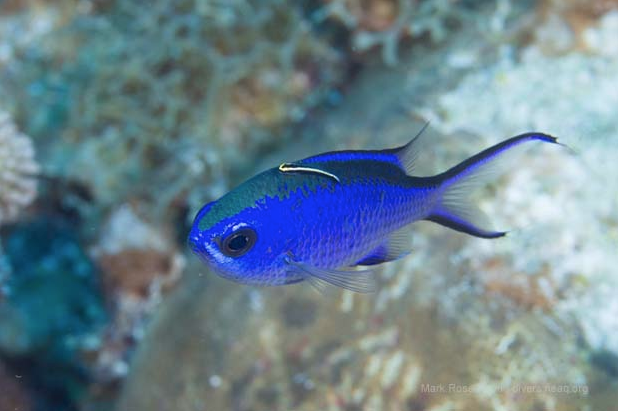 We started to wonder whether we actually had blue chromis growing in our tanks. By Day 12, there was no more wondering. It was pretty clear we had some kind of filefish. There are five species of filefish swimming around in the GOT (including orange filefish), so we weren’t completely sure which one we had until 65 days after hatching. By then the larvae were large enough so we could count the number of fin rays and confirm they were planehead filefish! 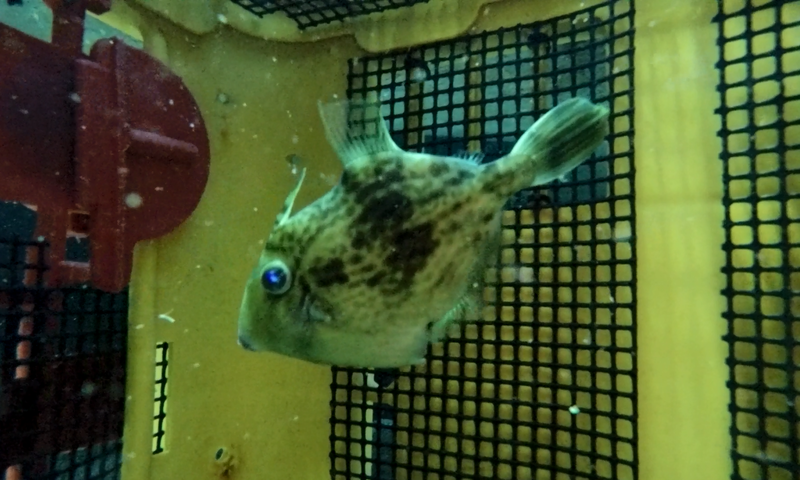 Even though they weren’t the blue chromis we were aiming to grow, this was the first time that anyone has successfully raised planehead filefish from eggs! We think the nest collected from the GOT last June was most likely a combined planehead filefish and blue chromis nest and the planeheads out-competed the chromis larvae for food early on in the game. Blue chromis are fairly small fish, but they make up for their small size with their aggressive temperament. Planehead filefish on the other hand are one of the more friendly species in the GOT, which makes us think the planehead filefish probably laid their nest first, then the blue chromis took the space over for their eggs and stayed to defend their nest. A couple weeks after collecting the eggs, one of the GOT divers was able to take the video below of two planehead filefish laying a nest and you can see how difficult it can be sometimes to find a quiet spot in the GOT to lay some eggs. 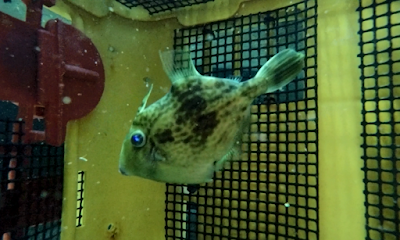 We ended up with 64 juvenile planehead filefish and just recently put four of them back in the GOT. The remaining 60 animals were sent to other zoos and aquariums all over the country so other visitors can observe and learn about this species. In the years to come, our goal is to exhibit more and more fish that came from our breeding program, so stay tuned for more success stories like this one!